Want to set up Google Optimize in WordPress? 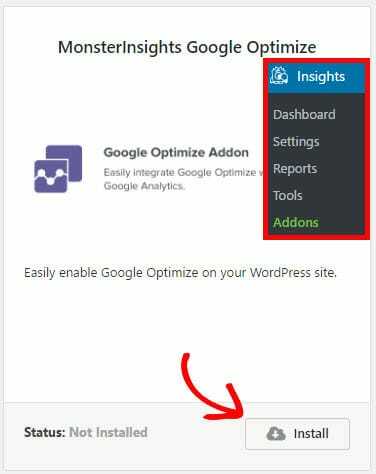 Just like Google Analytics, MonsterInsights allows you to set up Google Optimize on your WordPress site hassle-free. In this tutorial, we’ll show you how to how to set up Google Optimize easily on your WordPress site. Google Optimize is a free A/B testing and personalization product by Google that lets you conveniently conduct experiments to see what works best on your site. Google Optimize is just right for small and medium-sized businesses that need powerful testing, but don’t have the budget or team resources for an enterprise-level solution. Best of all, it’s built right on top of Google Analytics. With the Google Optimize setup, you can start using your Analytics data to conduct A/B tests and improve the user experience and conversions on your site right away. In order to install Google Optimize on your site, you’ll need to insert a small code snippet into your website header. If you’re a beginner, it can be a bit tricky. Thankfully, MonsterInsights has made the process very simple and beginner-friendly. It comes with a powerful Google Optimize addon that allows you to easily implement Google Optimize on your WordPress site. 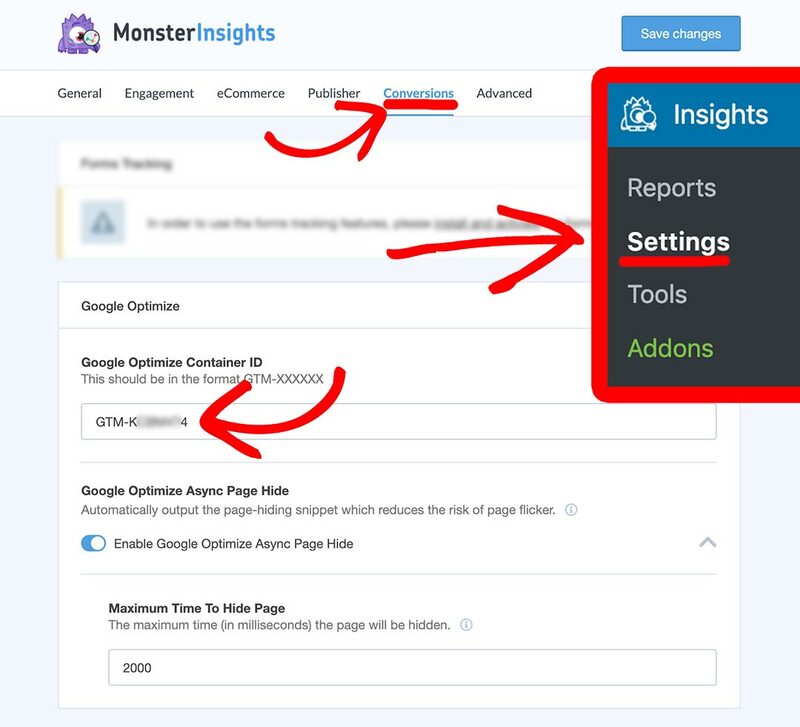 If you don’t know what MonsterInsights is, it’s the most user-friendly Google Analytics plugin for WordPress. It helps you to effortlessly set up Google Analytics in WordPress with just a few clicks. The plugin enables anyone to set up and use Google Analytics without touching any code. Having said that, let’s go ahead and see the steps to set up Google Optimize in WordPress (the easy way). Before we get started with Optimize setup, make sure you’ve properly installed Google Analytics on your site with MonsterInsights. If you’ve already done that, you can go ahead and install the Google Optimize addon now. To install the addon, you’ll need to go to Insights » Addons first. 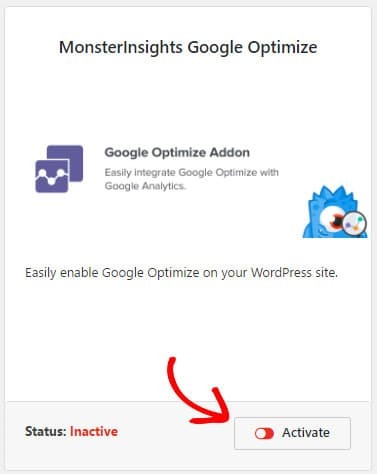 Then, navigate to the MonsterInsights Google Optimize addon and click the Install button. Once it’s installed, click the Activate button. Now that the addon is installed and activated, you can access your Google Optimize settings and add the snippet code. We’ll show you how later on in this tutorial. Next, you’ll need to create a new Google Optimize account. Go to optimize.google.com and click Get Started. 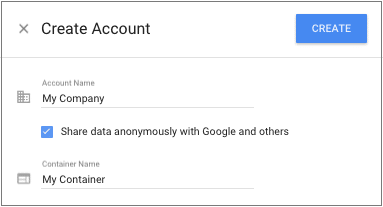 Now you’ll have to enter an Account Name and a Container Name. An account allows you to run experiments on one or more domains you own. You’ll likely need only one account. The container is where all your experiments and configuration settings will live. Then, Agree to the Optimize Terms of Service and click Create. 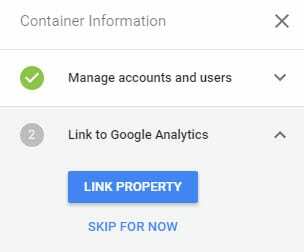 To link your Optimize account to your Google Analytics account, go to the Accounts page in Google Optimize and click on a container. In the Container information panel on the right-hand side, click on Link Property. Now, select the Google Analytics property that corresponds to the site on which you’ll be running experiments. Now return to the Optimize accounts page and copy your Optimize Container ID. This should be in the format GTM-XXXXXXX. Then, log into your WordPress dashboard, and navigate to Insights » Settings » Conversions. You can also click the checkbox near Enable Google Optimize Async Page Hide Compatibility. Doing so reduces the risk of page flickering (the original page appears briefly before loading the variation). It also ensures that users on slow connections have a better experience by only showing experiment variants when the Optimize container loads within the set timeout. You can leave the remaining field unchanged. That’s it! You’ve successfully installed Google Optimize in WordPress. Before conducting experiments on your site, you might want to check out this beginner’s guide to conversion optimization 101: split testing vs. multivariate testing.